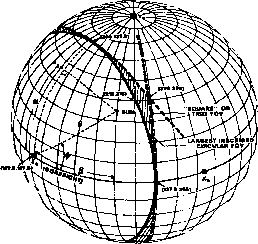 The earliest duel-spin satellite (OSO) used a two-degree-of-freedom pendulum nutation damper which consisted of a brass ball mounted at the top of a flexible steel rod [Cloutier, 1975]. The damping was provided by immersing the ball in silicone. Currently, one-degree-of-freedeom nutation dampers, such as those described below, are preferred. Mathematical techniques used to study passive nutation damping include the Energy Sink method used by Likins  and the Routh-Hurwitz stability method [Likins, 1967]. Nutational stability has been studied using Liapunov's second method by Pringle . If the satellite has many rotating components with many dampers, the resulting equations have periodically varying coefficients and stability can be studied using Floquet analysis [Meirovitch, 1970]; this approach has been used by Johnson . Eddy Current Damper. In an eddy current damper, the energy dissipation required for nutation damping is provided by the motion of a conducting plate relative to a magnet. The energy dissipation rate per unit weight due to the generation of eddy currents in the conductor is much greater than that of fluid dampers.